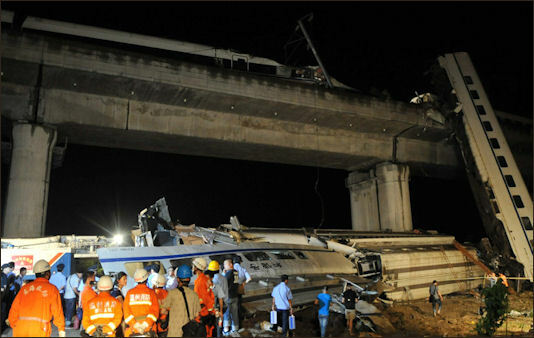 Wenzhou train crash In late July 2011, two high speed trains collided, killing 40 people and injuring 177 in Wenzhou, near Shanghai, in Zhejiang Province in eastern China. The accident occurred when one high-speed train rear-ended another that was traveling at a low speed on an elevated track on a concrete bridge about 15 meters above farms and fields. It was the first derailment on China's high-speed rail network since the country launched its bullet trains in 2007 with a top speed of 155 miles per hour, the China Daily reported. The Wenzhou crash was a heavy blow for the showcase high-speed railway programme and has invigorated public criticism over the costs and speed with which it has been rolled out. The trains involved are "D" trains -- first-generation bullet trains with an average speed of about 95 miles per hour and not as fast as the new Beijing-Shanghai line. High-speed rail has an excellent safety record elsewhere, especially in Japan, which has never had a fatality. The Economist reported: After a deadly high-speed train crash in Zhejiang province in July, the authorities sent bulldozers to bury the wreckage. The crash was an embarrassment; a reminder that China’s state-directed rush to modernise has involved cut corners, shoddy safety standards and a staggering amount of corruption. That contradicted the official storyline, in which China has become the world’s second-largest economy thanks to the Communist Party’s wise guidance. Rather than grapple with awkward counter-evidence, the party tried to bury it. Some Netizens watching video images and reading reports from the scene said it appeared authorities were burying the rail cars and had abandoned the search for survivors about six hours after the accident. Chinese President Hu Jintao and Premier Wen Jiabao called for an all-out effort to rescue passengers still trapped in the wreckage the morning after the collision several hours after China Central Television said the search-and-rescue operation had ended. A two-year-old girl Xiang Weiyi was discovered alive in the wreckage and rescued 21 hours after the train crash and 14 hours after the search and rescue had officially ended. This touched off a deluge of criticism over what was seen as a blatant disregard for human life. Microbloggers asked whether her parents and others could have been saved had the rescue effort not been called off. The Daily News newspaper cited experts warning that the faulty signal systems are still in use at dozens of stations along high-speed rail lines. Reiterating earlier reported findings, it said the crash occurred because a signal that should have turned red when lightning stalled the first train stayed green. Railway staff also failed to notice something was wrong. The Beijing National Railway Research & Design Institute of Signals and Communications Co, which made the signal, has publicly apologised after the crash. Japanese experts said that the moving train was a CRH2 model, a Chinese copy of Japanese Kawasaki Heavy Industries' Hayate Shinkansen (bullet train), which operates on the Tohoku line in Japan. The train that was rear ended was a CRH1, based on technology from Canada’s Bombadier Inc.
Japanese bullet trains have been equipped with automatic train control (ATC) system since they were introduced in 1964. ATC devices on bullet trains cause trains to automatically brake if they approach too close to one another. Rail safety expert Seiji Abe, of Kansai University, says that if China had implemented the ATC system used across Japan, the rearmost train would have been stopped automatically. He says the ATC system also includes lightning protection, which it appears China has also neglected. 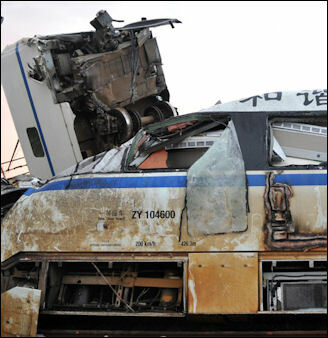 Professor Abe, who has worked as a rail crash investigator, says he doubts that Japanese rail companies will suffer any blow to their reputation because it is clear these trains are at best a copy, and probably one that does not include the necessary safety features. Other reports on the site said the ministry was burying parts of the wrecked trains near the site, prompting critics to say that the wreckage needed to be carefully examined for causes of the malfunction. More confusion emerged over efforts to portray nature as the culprit in the accident. Xinhua reported Saturday that the first train lost power when it was hit by lightning, and national television broadcasts emphasized pictures of lightning storms in the area. But later reports by Xinhua said the supposedly stalled train was under way when it was struck by the other train. Also left unexplained was why railway signals did not stop the second train before it hit the first one. Railway authorities decided to bury the derailed first car of the oncoming train at the site of the accident. The railway ministry said the car was buried so a crane could move into position, according to a statement on its website. The ministry also said the trains contained valuable “national level” technology that could be stolen and thus must be buried “even though foreign companies have long complained that the technology was actually stolen from their trains. China's state news agency Xinhua has denied widespread rumours that railway authorities tried to conceal evidence by burying carriages. 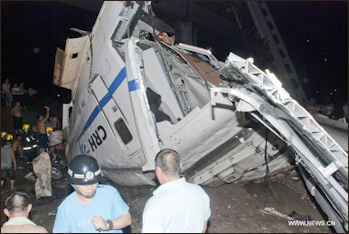 Citing an unnamed official with the Ministry of Railways, Xinhua said that "the problem of burying rail carriages and 'destroying evidence' does not exist during the handling of the whole of the accident".The report said that only the damaged parts of some carriages were buried at the site in order to facilitate clean-up and rescue operations. Reuters reported: “The Beijing National Railway Research & Design Institute of Signals and Communications Co. Ltd., in a rare admission of responsibility for a disaster, issued an apology, acknowledging it was the source of the deadly flaw. The Institute would "face up to shouldering responsibility, and accept any punishment that is due, and will strictly undertake pursuing culpability of those responsible", Xinhua reported, citing an institute statement. "Safety overrides all else, and high-speed rail safety is of even more overriding importance," said the Institute. Although news conferences of top leaders typically are broadcast live, China’s central television network, CCTV stuck to its normal programming throughout the event, prompting some Chinese to question whether the network was censoring the prime minister. Users of Sina Weibo, a microblogging site, kept up a running commentary. One writer questioned how Mr. Wen could have been confined to a sickbed for 11 days when the Chinese news media reported that he attended several meetings with foreign officials and hosted two sessions of the State Council, China’s cabinet. Others defended him. Ordinary Chinese, primarily through the Internet, insistently pushed the Wenzhou tragedy front and center, refusing to accept the government’s rationalizations and distractions. Using Twitter-like platforms on an unprecedented scale, people have clamored for answers to a hornet’s nest of questions. How was the accident caused by lightning? Why was the train behind not aware there was a train in front? Why was the rescue effort halted so soon? Why was the wreckage piled up into shallow pits before there had been a proper investigation into the accident’s cause? Why has a list of victims not been made public? Magazines and newspapers followed suit, reporting boldly on the facts and pressing for answers. At the very heart of all of these questions “and indeed of the tragedy itself “is a government that refuses to be held accountable for its decisions, and that admits no criticism when criticism might make the difference between bold vision and monstrous folly. Wenzhou train crash China's train system is overtaxed. However accidents with fatalities are rare. Many more people die making train lines than riding on them. In 1997 125 people were killed and 90 were injured when a train heading north on the Guangzhou-Beijing line crashed into train stopped at a station in the Hunan province. In August 2005, five people were killed and 30 were injured when a passenger train crashed into a cargo train in Liaonging Province. The accident was blamed on a signal failure that in turn was caused by electrical cables being stolen. In March 2009, nine construction workers were killed when a construction site in Jiangsu Province for China’s high speed railroad between Beijing and Shanghai collapsed, burying the workers. 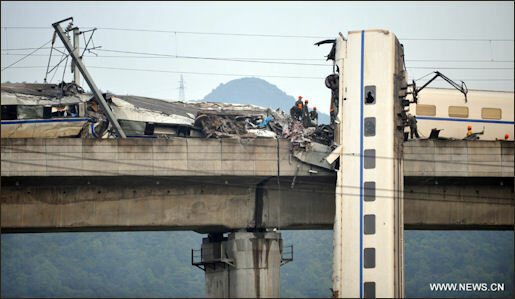 In June 2009, three people were killed and 60 were injured when two trains collided near Chenzhou in Hunan Province. Train cars derailed and careened into houses near the tracks. 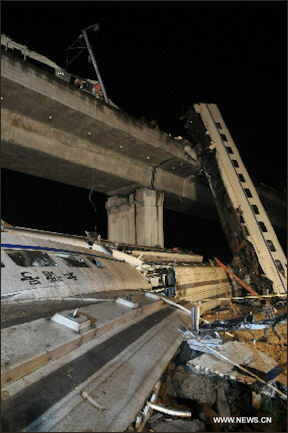 Wenzhou train crash In April 2008, a high-speed passenger train jumped the tracks and collided with another train near the city of Zibo in the eastern province of Shandong, killing 72 people and injuring 420. 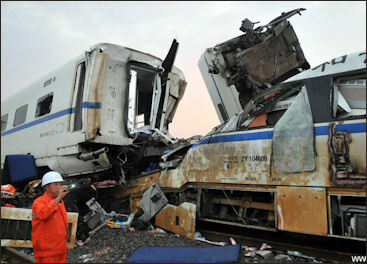 The crash occurred just before dawn and involved a train heading from Beijing to the city of Qingdao. Nine of the train’s 10 carriages were knocked into a dirt ditch, with several cars falling on their side. 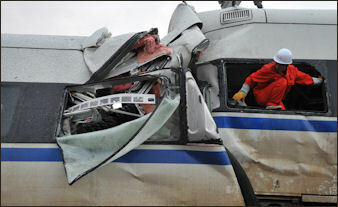 It was the worst train accident in China in more than a decade. The crash was blamed on speeding. Records show the train that jumped the tracks was traveling at a speed of 131kph over a section it was supposed to be traveling at 80kph. Local authorities were blamed for failing to order the Qingdai-bound train to slow down at a construction site, where an additional rail line was being built for the Olympics. Two high-ranking railway officials in Shandong were fired immediately. Six people, including the driver, were detained. It was the worst subway train accident in 42 years. CNN reported: Shanghai Shentong Metro Company, the city's subway operator, said a train on Metro Line 10 rear-ended another after an equipment failure at a station forced dispatchers to switch to manual mode. "It's the darkest day since Shanghai Metro began its operations," Shentong said on its official Weibo account, apologizing to all riders and promising a thorough investigation. One passenger on the first subway described to CNN the frightening moments after his train stalled on the track for about 20 minutes. "Suddenly we heard this loud noise -- the train started shaking and many people fell to the ground," said Duan Youxing, a recent college graduate. "Smoke came out between two conjoined cars and everyone just panicked." Local media reported Metro Line 10's signal system was supplied by one of the companies that also manufactured signal equipment for the country's high-speed railway. That company's design flaws were blamed for a fatal bullet train collision in July in eastern China that killed at least 40 people. Metro Line 10 opened in 2010. It had another incident less than two months before the September crash. In July, a train on the line traveled in the wrong direction and the subway operator later said the accident was caused by a signal system malfunction during an equipment upgrade. Some experts have long questioned the "great leap forward" strategy in constructing subway systems in cities across China, warning of potential safety issues. Shanghai, China's largest city, built the world's longest subway network in less than two decades. Shanghai Metro's first line opened in 1995, and now boasts 11 lines and more than 434 kilometers (270 miles) of tracks. It was not the first time there were problems on Line 10. Two months before a train took a wrong turn because of a signal failure, nearly leading to a collision. “The accident is an embarrassment for the Shanghai Metro operator because it had promised that the current signaling system would prevent trains from hitting one another,” the official China Daily newspaper said. The company that supplied signals for the Shanghai Metro also made the signaling equipment for the high-speed line in Wenzhou. Services on Line 10 were shut across a 13-station stretch most of the day after the wreck. Full operations on the track resumed at 8:00pm., Shanghai Metro said. The company limited train speeds to 45 kilometers (28 miles) an hour. As Shentong restarted running Metro Line 10 some Chinese netizens responded angrily to the news. "The injured are still in the hospital and the cause is still being investigated, how dare you announce the resumption of service already -- and with so much pride?" wrote user Liang Shuxin on Weibo. "It only shows the authorities don't consider ordinary people's lives worthwhile." Shanghai Shentong Metro’s Chairman Yu Guangyao told reporters hours after the accident that the collision happened because of a fault in equipment made by Alstom SA-backed Casco Signal Ltd. “The main cause of the accident has no relation with the signaling system,” Philippe Kasse, a spokesman for Levallois- Perret, France-based Alstom, said by e-mail yesterday. Casco Signal, a venture with China Railway Signal & Communication Corp., “can’t be held as responsible,” he said. The subway crash was a shock for Shanghai, a city of 23 million that had its entire transport infrastructure---roads, airports, ports, tunnels and subways---upgraded ahead of the city's 2010 World Expo. It occurred just two months after two bullet trains in east China's Zhejiang Province crashed, killing 40 people and injuring 177. The July 23 accident exposed festering resentments over the huge costs of the country's massive buildup of its rail system, especially its high-speed lines. The Shanghai accident highlights some of the risks of hasty construction and deployment of showcase infrastructure, especially given China's poor track record for industrial safety. The affected line---Line 10---operated by Shanghai Shentong Metro Group, is one of Shanghai's newest and most modern. A loss of power on the line during repairs caused the signal system to fail and dispatchers then issued faulty orders that caused one train to rear end another as it sat still on the tracks in an area near the city's scenic Yuyuan Garden. The report said Shanghai Shentong's first mistake was in authorizing repair work at a station without having a contingency plan in case it disrupted the power supply. The repair work caused a loss of power to the station that led the signaling system to fail. "Shanghai Shentong should be people-oriented, put safety first, and draw deep lessons from the accident," the report said. It said the metro operator would face maximum financial penalties for its lapses, without giving any details. The report also cited problems with installation of backup power from uninterrupted power supply---UPS---equipment, which should have kicked in to prevent any lengthy power outages. With the power out, subway operators then chose to direct trains on Line 10 via phone instead of electronic signals and ordered a train to stop in a tunnel between two stations. About half an hour later, another train started out from one of the stations and headed toward the halted train at a speed of up to 54 kilometers per hour (34 mph), until the driver saw the stationary train and immediately tried to brake. It crashed into the stationary train at a speed of 35 kph (22 mph). Although the train was crowded at the mid-afternoon time of the crash, the relatively slow speed helped to reduce injuries, most of which were light and not life-threatening, according to city officials. High-tech automatic train protection systems are designed to improve safety while allowing more trains to travel within shorter intervals. Normally such systems prevent crashes by controlling train speeds and signaling the presence of any other trains on the line. The supplier of the signaling system for the line---a joint venture between a local company and France's Alstom SA---denied earlier claims by the subway operator that its equipment malfunctioned, saying the crash had nothing to do with its system.